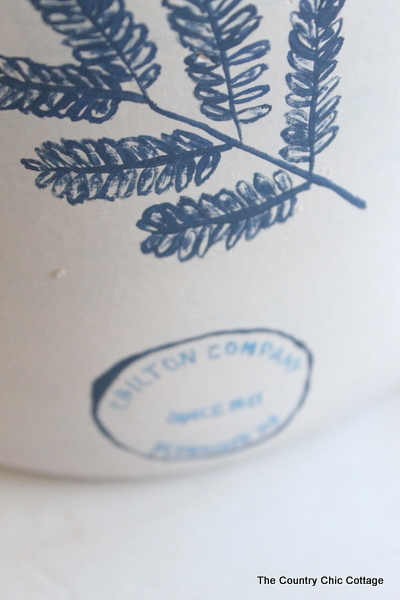 I am here today with a fabulous Pottery Barn Knock Off Canister that you are going to love. 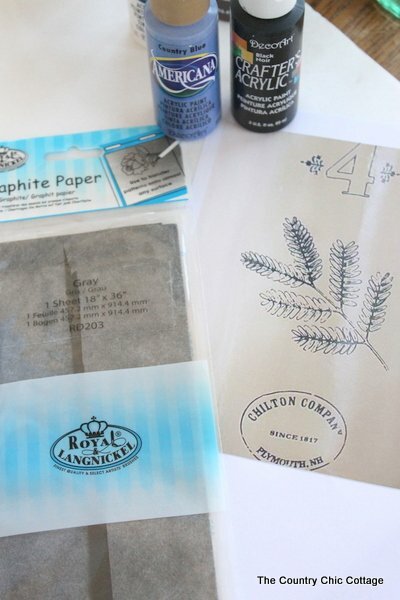 I am lucky enough to have DecoArt sponsoring occasional posts using their product. Grab your paints, a thrift store canister, and lets get painting. 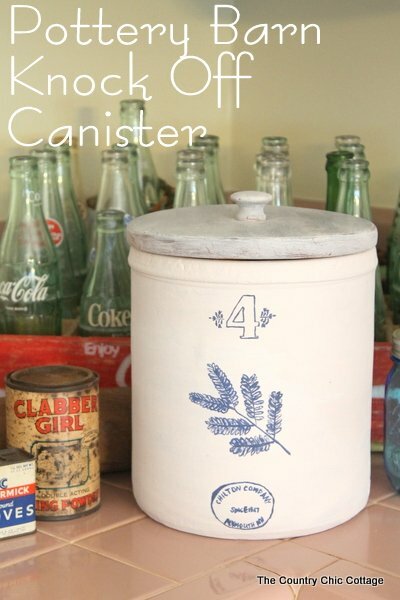 First lets compare my version of the canister to the Pottery Barn original. Not bad for an $87 savings huh? This journey started with an obsession with the PB original. I loved it but could not afford to pay almost $90 to store my dog treats. (What? Can you?) 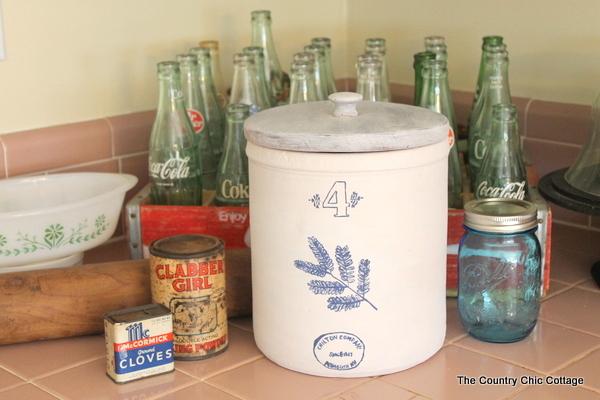 So I stalked my thrift stores, garage sales, anywhere I might find a canister on the cheap. After weeks of searching, my eyes landed on the beauty below at a thrift store for $2. Oh yes…sold. Boy it doesn’t look like much there does it? It was right out of the 1970s and was in need of a new home. I first painted the entire thing with an off white paint from DecoArt. 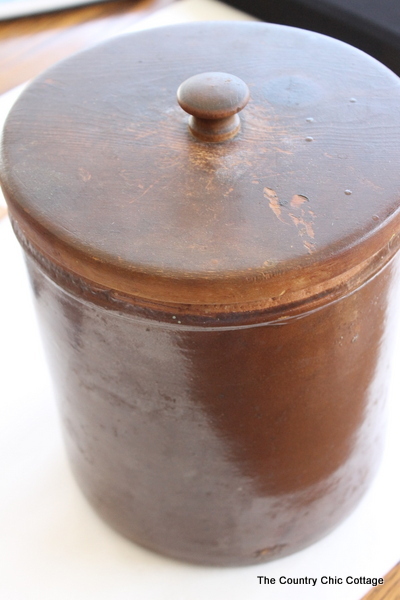 The lid received a coat of the same color paint just a very light coat. Then it was time to paint that decorative detail on the front. I printed out an extra large copy of the PB version and grabbed my graphite paper. 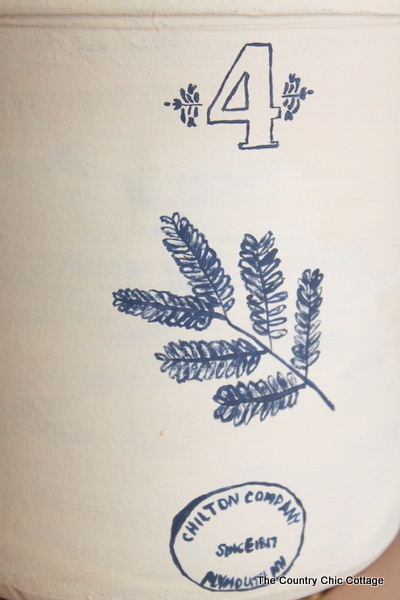 I traced the PB image right onto the front of my canister using the graphite paper. No it is not perfect but the lines are close enough for me to paint in a facsimile of the original. I play around with blues and blacks until I landed on a paint color I loved. 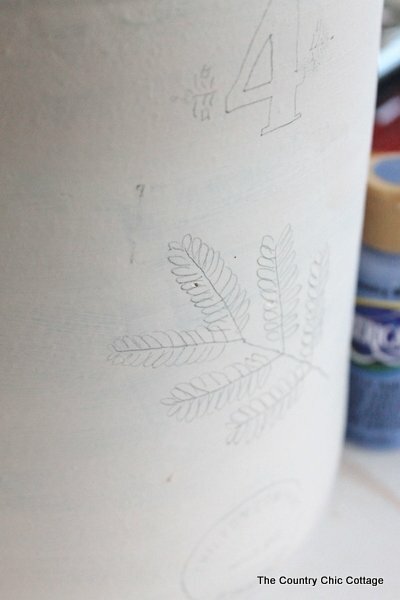 I then started filling in the lines I made on my canister with paint. I kept my picture of the original version close at hand and tried to mimic the brush strokes. The writing at the very bottom was hardest of all. I actually traced the letters with a blue fine line marker before painting them. The letters and the painting are perfectly imperfect which I think is what makes it look even more authentic. Remember this is a knock off of a piece that is supposed to look vintage. Don’t get fussy with your knock off just free hand your painting and have fun with it. It should look hand painted and vintage just like the original you are trying to mimic. I am using my Pottery Barn Knock Off Canister to store the dog’s treats. Stay tuned tomorrow as I show you where this one ended up and the changes I have made in my kitchen organization. 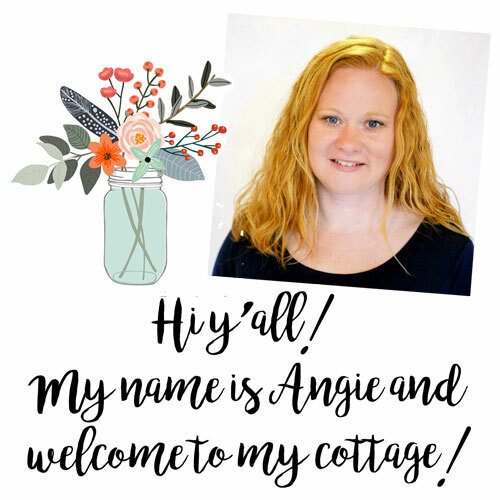 I am a member of the DecoArt core blogger program and I have been compensated for my participation. However the project and opinions are all my own. Angie, It looks fabulous. I actually prefer yours over the PB one!!! Good job! I love this idea. I think I’ll do a couple using small canisters and put them on my mantle. Love your blog. I like yours better!!!!! Wonderful job! I love when you can recreate things for less than half of the cost of the original! It looks great!! 🙂 Did you seal it with anything when you were done? Angie, What a wonderful job you did! I think yours looks older and more authentic than the PB version. Well, that is just too cute! its ok but the lid does not fit tight…and if I were to use it..I’d be VERY particular about that ! I like to PB size better!! That really really looks great! Pinned it!!! This looks wonderful! It turned out so nice! Thanks so much for sharing. Leave being able to reproduce the Pottery Barn item so closely to you Angie.You did great job. Could sure have fooled me. Was wondering how you would reproduce Chilton mark on bottom, great job. So fun to reproduce an expensive item. Can’t imagine paying that much for dog treat holder. Thanks Jane! I still love this project!